Asbestos is the only cause of mesothelioma, pure and simple. Patients suffering from this fatal disease have often sought mesothelioma settlements and trials to secure financial compensation from companies that knowingly exposed them and other coworkers to asbestos in the workplace. 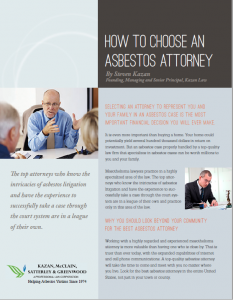 Most asbestos cases are settled before they ever get to a jury. In most cases, companies know they’re at fault and, ultimately, responsible for the asbestos-related illness. If their case is weak, and their liability is clearly evident, they may choose to offer a settlement rather than go through the process of a mesothelioma trial. However, this doesn’t mean the defendant will offer the best settlement. It is up to the patient’s attorney to fight for the best compensation possible. Companies responsible for a patient’s asbestos exposure sometimes will not agree to pay for any type of compensation. In these circumstances, the case would escalate to a mesothelioma trial. If you have been diagnosed with mesothelioma, it’s important that you gather all the facts about your medical condition and employment, find an experienced trial attorney that specializes in mesothelioma settlements and trials and then fully prepare your case. Public acknowledgement of wrongdoing: A trial may expose corporate misconduct. The victim has the opportunity to publically prove, on record, that his or her illness was due to the willful negligence of a company or companies that caused exposure to asbestos contaminated products. Settlements, which are typically private, often protect a company from making a public statement of guilt. That is why some people choose to go to trial, where the negligence will become public record. For the past 42 years, the attorneys at Kazan Law have held a track record for successfully litigating mesothelioma cases and exposing negligent companies for their reckless acts. Their wrongdoings generate significant publicity and awareness, which often helps protect more victims from future and unnecessary asbestos exposure. Trial length: The process of preparing for a trial can take several years and many hours of consultation with you. In addition, the trial itself can be a very lengthy process that can take time that victims don’t have. For this reason, many seriously ill victims prefer a quick settlement. Conclusion: Although the award may be monetarily greater, there is no definitive time frame for a conclusion to a trial. Your legal team will work with you to assess your case, and determine the best strategy for achieving the most favorable outcome. Reaching a mesothelioma settlement is an option you can discuss with your family and your attorney. You should consider some of the following issues when determining what the best course of action is for your lawsuit. Guaranteed compensation: Once the settlement is mutually agreed upon, you are assured compensation from the company or companies responsible for your asbestos exposure. The settlement cannot be appealed and remains intact. Save precious time: A settlement can save precious time compared with a trial. Often times a settlement can be secured in one year or less. When you agree to a settlement, the legal process ends. For a very ill mesothelioma sufferer and family, this is often a vital consideration for the well-being of all involved. Settlement compensation: A settlement is meant to reflect a mutually agreed upon amount between both sides. The final settlement is a reflection of a negotiation and may be lower than you had originally sought. Guilt or responsibility: A settlement means there is no admission of guilt or responsibility from the defendant company. For some people, this omission of guilt plays an especially difficult role in the settlement process. As the plaintiff, you must be prepared to relinquish, and let go of, the vindication that can be earned with a guilty plea. As a victim of asbestos exposure, you are entitled to justice and a fair financial settlement– to help with medical bills, lost wages and quality of life for you and your family. Since 1974, defendant corporations and their lawyers have learned that trying cases against Kazan Law is rarely fruitful and almost always very expensive. As a result of our reputation as pioneers in the asbestos litigation field, these defendant corporations are motivated to settle cases with us. If you have been exposed to asbestos, speak with an experienced asbestos lawyer about your options. Contact Kazan Law today to request a free consultation.